Escribir corto, para concluir antes de hastiar. Stop using yardage for penalties in most situations. Limit the number of players on the roster to 30. Restrict the amount of padding, helmets and other protective gear that players can use. Put motion sensors in everything. Expand the season to twenty four weeks, with twenty games and four bye weeks. Don’t punish players for using marijuana. Take players’ names off their jerseys. Require teams to put their stadiums in the cities for which they claim to play. Aggressively penalize any gloating, celebrating, dancing or other shenanigans. Goalposts should have a top bar. Don’t let announcers refer to players by their first names. Reduce the number of players involved in kickoffs. Limit the number of times per half that a team can punt. Get rid of the stupid chains. Ban players from giving any media interviews during the season. – Bonus: end the salary cap and free agency. Since then, I’m pleased to say, there are a couple of positive signs that things are improving in the NFL. For example, Gizmodo says The NFL Will Start Playing With Chip-Equipped Footballs This Summer and Consumerist says the NFL (is) Literally Studying Whether It Should Move The Goalposts (LITERALLY). It’s nice that professional football is evolving, but I still think there are a lot more good ideas that ought to be discussed. Below are some more. Enjoy! Regulated uniformity is boring and diversity is exciting, so every team should be free to have a (slightly) different size field. This will make it much more difficult for visiting teams who are unaccustomed to strangely sized fields, but also much more difficult for a team that has a strangely sized field when they travel to play a game elsewhere. I do think some parts of the field should be standard: it needs to be one hundred yards, marked in ten yard increments. But I see no reason why the field width can’t be left up to the decision of each team, and also the size of the end zones. Nor would it bother me if some teams’ fields weren’t perfectly flat, with inclines and depressions in different areas. Nor would it entirely bother me if the definition of the unit of measurement “yard” varied a bit between the east coast and the west coast. This works really well in baseball, so I’m excited to see how well it plays out in the NFL. When a team violates certain big rules, such as hitting a defenseless receiver, the other team should get their next score. If the offending team doesn’t manage to score again, then nothing would happen – or the next score penalty could be carried over to the following week’s game, or even from one season to the next. I expect that a next score penalty would cause teams to try to hurry up and get a field goal as quickly as possible, resulting in a lot of interesting risks and big plays – and big flops. The result of an incomplete pass is a loss of the down, and this encourages teams to pass more, as they don’t give up very much even with a low completion rate. What if an incomplete pass resulted not in a loss of the down, but in a loss of yards? It could either be a set amount of yards, such as three, or the yardage lost could be equivalent to where the quarterback was standing when he threw the ball. Even better, the defense could get to choose after each incomplete pass whether to go to the next down at the previous line of scrimmage or repeat the previous down, with the lost yards. How is it that there are two people on every NFL team who don’t really do what we would normally consider to be “playing football,” one of them only punting the ball and one of them only place-kicking it? It’s really dumb to have people whose tasks are so specialized, and particularly so tangentially related to football. So teams should not be allowed to have players who only kick the ball. One way to accomplish this would be just to make the quarterback be the kicker. Or when kicking off after a score, the person who scored could kick. As a fan of a team with one of the greatest rivalries in professional sports, I think it’s great that my beloved Redskins get to play the hated Cowboys twice every season – because they’re in the same division. It’s terrible, though, when players and coaches go from one division rival to another, like Alfred Morris or N*rval Turner. This reduces fan loyalty and makes me like the game less. Players and coaches should be banned from leaving one team to join another team in the same division immediately. The standard contract should specify that they can not sign with a division rival for a time period equal to the length of the contract. I can hardly think of something more non-football-like than a coin toss. This boring ritual should be replaced with an exciting ritual, such as an arm wrestling match between the two teams’ head coaches (or their owners)! Salary caps are inherently unfair, in a calculated way: the aim is to get every team in the league spending roughly the same amount of money on players. Roster limits (i.e., no more than 53 men on a team) are also inherently unfair, for the same reasons. I accept the concept of these inherent unfairnesses, but I see no reason at all to have both a salary cap and roster limits. Going with only a salary cap, a team could go out and recruit hundreds or even thousands of potential players, paying them each very little money (current average annual salary in the United States is slightly higher than $50,000). If that’s how they want to spend their money, let them do it! Going with only roster limits – well, we know how this would work, because it’s how things work in other sports that don’t have a salary cap. This approach allows players to negotiate sky-high salaries, and it allows owners who are super rich to build great teams, while owners who don’t care or can’t afford it have to focus on drafting wisely. One of the fascinating storylines every football season (and something that actually plays out on rare occasions) is what happens when the starting quarterback gets injured, and his backup gets injured, and the third-string guy (if there is one) also gets injured: who then takes the snaps? Typically there’s another guy on the team – often a wide receiver, I think – who’s supposed to do it. And of course, this could happen as well as part of a trick play. It should happen more often. No single player should be allowed to take more than thirty snaps in a row. I hate it when players blatantly signal to the referees to call penalties against other players. It’s unprofessional and obnoxious. It should be a personal foul for a player to accuse another player of breaking a rule. Previously I suggested we shouldn’t let announcers call players by their first names, and now I’ve come up with what I believe will be an adequate way to deal with this. Any time an announcer refers to a player by his first name, the NFL should fine the television or radio network, unless the network makes the announcer apologize on air. One of the critiques of football from non-fans is that the players spend so much time not-actually-playing. As someone who’s watched the game for a few decades and played at a much, much, much lower level, I understand why it takes so much time between plays, but I still think there should be ways to speed it up. Right now the play clock allows forty seconds from the end of a play to the next play (or twenty-five seconds after a timeout or something like that). I’d like to take away five seconds from the play clock per quarter. So in the first quarter there would still be forty seconds, but in the second, third and fourth quarters, the play clock would only have thirty-five, thirty and twenty-five seconds respectively. This could have a dramatic impact at the end of games, when players are exhausted and fans are on the edges of their seats. Previously I suggested that the league should fine teams whose players “take a knee” because it’s unprofessional and ruins the game. I’ve come up with an idea that I think would be better than monetary fines for millionaires and billionaires: teams that take a knee at the end of a half should have that time deducted from the play clock in their next offensive series, even if it’s in the following week’s game (or even if it has to carry over to the next season). Here’s an even better idea: since typically only a winning team would take a knee, if they do it, their previous score should be forfeited. I can’t be the only person who thinks that touchbacks are pretty crappy. Recently the rules were adjusted so that the receiving team gets the ball on the 25 yard line rather than the 20 yard line, a slight disincentive to the kicking team to kick too far. So that’s an interesting idea, but unfortunately it increases the incentive to the kicking team to let the ball go into the end zone on a kickoff, disincentivizing them from actually returning the kick (presumably for safety reasons), which I don’t like. – The receiving team gets the ball at their own one yard line. This would cause a huge increase in safeties, and incentivize returns. – The receiving team gets the ball at the kicking team’s one yard lines. This would cause a huge increase in touchdowns, and incentivize more strategic kicking (and a massive investment in kickers who are able to kick not just powerfully, but precisely). – Make a touchback count as a score – maybe one point – for the receiving team. Benefits: it depends, but safety and strategy. Previously I advocated limiting the number of players involved in kickoffs and punts and I stand by that idea, though it’s also possible that I’m entirely wrong and that it would make those plays even more dangerous than they already are. So how about this idea: the receiving team should get a head start of three seconds after touching the ball, before the kicking team is allowed to make physical contact. A fifteen yard field goal earns the same number of points – half a touchdown – as a sixty-four yard field goal? Come on, nobody thinks this makes sense. Instead, longer field goals should earn more points. I propose one point for every ten yards. – Zero point conversion: no kickoff, and other team’s offense has to start on their own one yard line. There should be a lot more teams in the NFL, probably twice as many. If there were many more teams. I have tweeted nine thousand, nine hundred ninety-nine times, which is perhaps more times than any person should ever tweet. And when I publish this blog post and share a link to it on Twitter, it will be my ten thousandth tweet, which I’ll pin at the top of my twitter timeline for a while. To commemorate the momentous occasion, I thought it might be worthwhile to share a few thoughts on what Twitter means to me, what I think is wrong with it, where I think it’s headed and how I think it could be improved. The problem is that, while I was able to articulate almost twenty specific ways to improve football last summer that were all related to a few general points, with Twitter I’ve got a ton of specific complaints and very limited ideas about how things could be improved. I think this is a good place to begin. Twitter is a product, originally intended to take the idea of blogging and reduce it to SMS-length statements, that lets anybody access twitter.com, sign up for an account and start writing 140-character statements in boxes, that appear on a reverse-chronological timeline. Simple! Twitter is a platform that lets developers create third-party applications that access the twitter.com service, which is why anyone can avoid going to the actual twitter.com website by using Twitterrific, Tweetbot and hundreds of other programs. Twitter is a community where discussions happen – sometimes serious and sometimes frivolous, sometimes ephemeral and sometimes evergreen, sometimes friendly and sometimes bitter, sometimes in public and sometimes obscured behind anonymity or privacy, sometimes in real time and sometimes delayed over weeks and months. Twitter is a company that develops Twitter the product but sometimes makes a mess of it or lets it fail, that relies on Twitter the platform but also tries to ensure that its own applications will be supreme, that nurtures Twitter the community but also bungles its task and alienates users… and that tries to make a profit for its shareholders. What should Twitter be? It has to be all of the above things, but that’s in no way possible: you can’t be a consumer product while engineering a service that third-party developers, who also build competing consumer products, can support equally; you can’t be a platform with equal access while trying to make money from advertising; you can’t be a profitable company while nurturing and moderating and also policing a community; you can’t be a community while also improving (ie, changing) your product to be more like others and less like it once was. RSS is a daily part of my life, as it should be for everyone’s life. For those who don’t know what it is or quite understand it: once upon a time, whenever we wanted to know when something new was posted in a certain blog, we’d have to go to that blog’s home page. For those of us who had five friends with blogs, that meant we might be going to five websites every day. For those who had five hundred friends, rivals, professional contacts, divergent interests, communities, &c., that meant we might have spent the majority of our waking hours checking websites for updates, which was untenable. There are a ton of ways to apply RSS, from simply keeping in touch with friends to staying on top of breaking news to integrating feeds from one site into another site, and lots of things around the internet are built to rely on RSS. As a microblogging service, there’s a considerable overlap between Twitter and RSS. While an RSS feed contains just a URL and then some metadata like publication date, text snippet, title, &c. tweets also can contain those things – or can be just a brief statement with the equivalent metadata, or a picture or video with the equivalent metadata. So Twitter is in some ways comparable to RSS, but with more flexibility and more features. Ideally, Twitter and RSS would both thrive and evolve semi-independently, but in reality, there’s been a slow shift away from RSS and towards Twitter because Twitter is sexier and more feature-rich and requires less investment in development and maintenance by publishers. For example, many journalists who cover breaking news stories are now using Twitter primarily or exclusively, instead of RSS, to get their news 1)I seem to recall that Farhad Manjoo wrote about this in an article for Slate, some time around 2012, though I’m having trouble locating the article now.. There are also sites that, like blogs, are updated frequently and that eschew the very logical RSS in favor of a somewhat less logical Twitter as a way of announcing regular changes (one example is Mozcast). RSS is meant to be used by completists: that means you subscribe to an RSS feed with the intention of checking every single item that appears in that feed – though obviously sometimes this isn’t desirable, like when you’re on vacation or busy with other projects – and makes it possible by letting you mark seen items as “read” and leave unseen items as “unread” 2)Though he may not have invented the term “completist,” I first heard it from John Siracusa on the Accidental Tech Podcast.. Twitter, while often used by completists (I am one, for example) does not intend for its service to be used this way, and intentionally makes it difficult to do so. Therefore, when Moz chooses Twitter over RSS for Mozcast, it is actually making their product more difficult to use for their intended audience, SEO professionals. Google deserves a lot of the blame for harming RSS by not supporting it on google plus, which nobody uses anyway, and by killing Reader 3)Feedly is trying to reverse that, and everyone should buy a Feedly Pro account to support their work.. But when publishers make the decision to ignore RSS in cases where it would make sense, in favor of Twitter, that has the effect of damaging the longterm viability of both RSS and Twitter by making Twitter do something it’s not really meant to do. Hashtags serve a very important purpose in the Twitter universe, and it’s no accident that they’ve been copied by many of the (more financially successful) companies and services that are similar to Twitter. Their role is to allow tweets to be filtered topically, so that anyone can find all the recent tweets about a certain topic. But their use is getting out of hand. You should #read this important #article about the #Iran #nuclear #deal that #President #Obama is signing but which #Israel’s Prime Minister #Netanyahu and #Saudi #Arabia both oppose. This practice is usually done by certain people: the kind who want to attract the most possible attention to themselves – well, really to their Twitter identities – by getting their tweets to show up in as many searches or filters as possible. And sometimes that’s not so bad, like when there is a breaking news situation and nobody knows what the “right” hashtag will be, so it does make sense for people with substantial updates to help everyone else find them. But overwhelmingly, this is done out of vanity. Can we all agree that more than a couple hashtags per tweet is excessive, and that doing it more than a couple of times is insane, and that it degrades the experience of following someone on Twitter? Unfortunately, Twitter gives users no way to mute tweets that contain more than a certain number of hashtags. Because social media marketing exists, it is sometimes valuable for a company’s Twitter account to be followed by a lot of other Twitter accounts. And because of that, it sometimes makes sense for spammers to create a ton of gibberish, nonsensical Twitter accounts and sell them to marketers. But if Twitter gets to a point where 95% of its accounts are fake, then real people will flee the platform to competitors. So they make algorithms to detect fake accounts by things like creation date, IP address, velocity of followers, &c. And then the spammers get more sophisticated by… following real accounts and attempting to interact with them (or at least to make it appear like they’re interacting with them), so that their fake accounts seem credibly real. This is why, of all the new followers on my Twitter account, probably two thirds are fake. It’s also why probably three quarters of my mentions are spam. I aggressively report these fake accounts to Twitter and they virtually all get removed within a few hours, which is why, going through my followers list, I see very few accounts or mentions that I think aren’t genuine. I’m not very popular at all on Twitter – I have just around 500 followers. Imagine if I had 5,000 followers, or 50,000, and a majority of my new followers were fake: it would be a huge drain on my time and energy to check them all out and report the bad ones. This would lead me to stop looking into the new people who follow me, which would lead to decreased interaction with the real people. New Twitter users who followed me would be less likely to get a follow back or a “Welcome!” tweet or a timely retweet by my account. This is exactly what happens and it’s one of the reasons why new Twitter users often don’t stick around on the service. In part to deal with the problem of follower spam, Twitter uses an algorithm to determine when to notify me by email of new followers, and when not to notify me. Unfortunately, this algorithm is garbage, and it very frequently notifies me of bad accounts and fails to notify me of good accounts. In one case, I was contacted by someone on a different social network who’d been following my Twitter account for some time. I looked at some of her tweets and it sounded like she had a lot of interesting things to say. But for how long had she been following me, and how had I missed the notification? I couldn’t easily find out, because Twitter had never sent me an email to let me know. I understand that some people don’t like getting over-notified and that notification fatigue is a serious problem for social networks like Twitter that attract hundreds of millions of people who all have different tastes about how many emails to get and which emails to get. They do try to make it possible to adjust email notification settings, but this introduces some possibly unnecessary complexity, which scares away new users. As a result, they’ve managed to alienate both intermediate to advanced users and novice users. I don’t know if there’s a solution for this problem, but if there is, it might be something like notification profiles: check this box to get absolutely no email notifications ever, check this box to get the minimum number of notifications that Twitter thinks you might want, check this box to get the maximum number of notifications that Twitter thinks you might want, check this box to get every single possible notification, or check this box to adjust how strong the spam filtering should be on a few different metrics (don’t send follow notifications for users who signed up in the last seven days, for example). I want to do as good a job as Ben Thompson did in explaining Twitter’s tumultuous relationship with its third-party developers, but I can’t, so you should just read what he wrote. Instead, putting aside Twitter’s motivations, I’ll point out that the way Twitter the company squeezes its developers is extremely crappy for the users of Twitter the product. If Twitter wasn’t doing a lot in its power to prevent other companies from making a living by developing for it, Twitter the platform might be vastly more popular. There would be far more Twitter apps than there are today, and the apps would be far better. I’m referring in particular to situations like the almost unsupported and abandoned Twitterrific Mac app, which was bad enough to convince me to switch to Tweetbot for Mac, where I’m a bit happier. If Iconfactory knew that they could build a business around improving this software, they’d do so. But they know the opposite, so they do the bare minimum to keep it running. And I’m referring to all kinds of missing app features, like integrated multi-account timelines, better localization, improved integration with competing services like Instagram, stuff like Tweetdeck used to do before Twitter bought it and ruined it, community-based apps that let users interact only with each other or only with people who aren’t blacklisted, apps specifically for journalists, apps specifically for celebrities, &c.
As noted above, one of the reasons that Twitter has such a difficult time allowing and regulating third-party apps is that the service makes its money by advertising (specifically, native advertising). I’ve spent years working for publishers who make their money in this way, and I don’t think it’s necessarily bad. In a bunch of cases, I actually think native advertising provides a win-win-win, which is the holy grail of monetization 4)Examples: podcast sponsorships on shows like John Gruber‘s The Talk Show and Accidental Tech Podcast that legitimately inform me about products I sometimes end up buying; or certain “custom” articles on my previous employer’s websites that helped people learn about new medical treatments.. But mostly, native advertising is awful because it’s deceptive to users, because it distorts publishers by messing up their incentives and because it’s difficult to measure it and prove that it’s more effective than, say, display or affiliate advertising. Twitter’s primary version of native advertising is called promoted tweets, and there seems to be a rule that promoted tweets must be awful, because in my experience they are invariably irrelevant, dumb, pointless – and a waste of money for advertisers, bandwidth for twitter, and time for me. I hate them (and if you think it’s just because I hate advertising, please see the previous paragraph). The best thing I can say about promoted tweets is that I only ever have to see them if I’m using one of Twitter’s own first-party apps or if I’m on twitter.com. Since I can avoid them by using third-party apps, I use third-party apps almost all the time. By the way, there are also promoted accounts, but I haven’t interacted with these. And yet, I’d like Twitter to be able to make some money off of me. A tip jar is a stupid idea, but how about pursuing a freemium model like many other services do? This would mean, in essence, that Twitter is free to use, but if you want to use it certain ways, or if you want access to certain features, you’ll need to pay some money. Marco Arment wrote years ago about the desire to pay for free services so they don’t disappear (and so they don’t resort to doing annoying or sketchy things to make money) 5)Though this may make it seem like Marco opposes freemium services, that isn’t the case: freemium is how he makes money from Overcast.. I sometimes share this desire, which is why I paid to support App.net, Feedly, &c.
How much money has Twitter ever made as a result of my membership and use (ie, what is the average lifetime value per user to Twitter of someone like me)? If I had to guess, I’d say with more than 90% certainty that it’s less than $10, and with 75% certainty I’d say that it’s less than $3. But if Twitter would allow me, I think it would be great to have the option of paying them $50 one time, or $10 per year, or $1 per month – in exchange for never having to interact with another advertisement on their platform during my paid-up period. Why hasn’t Twitter done this? Are they afraid of alienating new users who are easily confused 6)The image of the Twitter novice, who’s apparently in a state of permanent befuddlement, can not possibly be accurate, since we were all Twitter novices at one time.? Do they not think it would be profitable? Have they simply not thought of the idea? Monetizing their best users via a freemium model would allow Twitter to align its interests with those of its users (if I’m poor or stingy, I don’t have to pay and can keep seeing advertisements; if I hate the advertisements, I can pay and they’ll be taken away), its third-party developers (no need to coerce people to user twitter.com or Twitter’s own first-party apps means no need to make life miserable for app developers) and even advertisers (no business wants to advertise to people who hate the advertisements). I’m not a video game player or a progressive political activist, so when progressive political activists tried to compel the video game industry to change the way it portrays women, I probably never should have heard about it. But instead, I was subjected to months and months of the most tendentious and spurious arguments from both sides about each other, and while this permeated many areas of my life that should have been insulated from it, ground zero of “gamergate” in my experience was Twitter. This happened even though I didn’t follow any of the people who were directly involved, but rather because people that I did follow would retweet their side’s comments. And to this day, I continue hearing from both sides about harassment, doxxing, death threats, bullying and all manner of immature stupidity that the other side has supposedly done. And critically, there’s an insane amount of pressure on Twitter to… well, it’s unclear what Twitter is supposed to do. Should Twitter simply provide a platform to let people speak, ban users who have promoted specific acts of violence because incitement to violence is illegal, and stay out of its users’ squabbles? Should Twitter build tools that allow people to filter each other out, block each other individually or en masse, blacklist or whitelist each other, mute topics or hashtags? Should Twitter declare that “harassment” is banned, but give only the vaguest definition of “harassment,” and then allow users to report each other for “harassment” and suspend accounts of those who were reported, with only the most tenuous justification? Personally, I hate that I’ve had to mute (but not block) a few Twitter accounts because people I follow kept retweeting them, and I hate that some accounts I follow have been suspended, and I hate that other people are using automated block lists against each other, and I hate that other people have left Twitter because of all of this. I certainly don’t know what Twitter should do about it, but I do know that they should pick an approach and follow through with it. Unfortunately, instead of doing one thing or another thing or a third thing, they appear to have decided to take a bit from Column A, a bit from Column B and a bit from Column C. And this has led to both sides losing, and innocent bystanders losing as well. Here’s something I can keep short and sweet. Twitter’s implementation of two factor authentication is non-standard and sub-par. Good online services like, to pick two examples more or less at random, Slack and Github, allow their users to authenticate via third-party apps like Authy or Google Authenticator. But for some reason, Twitter requires me to use either SMS or the Twitter app for iOS. Using SMS for something like this is a terrible idea because it locks exactly one telephone number to exactly one Twitter identity (you can’t have multiple numbers per account, and you can’t have multiple accounts per number), and using the Twitter app means that I have to keep it on my iPhone and allow it to send me notifications. Twitter really dropped the ball on this. I thought I’d save the best for last. Though lots and lots and lots of services now have microblogging-like features, and Twitter wasn’t the first microblogging service, Twitter is almost synonymous with that medium in people’s minds. But some of the other things Twitter can do are great, such as including Twitter cards, geolocation, photos, videos, retweeting, quoting (retweeting with an additional comment), @ mentioning someone, hashtagging. Many, many, many people who use other services like Instagram would probably be better served by using Twitter for the same, or similar, things (after all, Instagram is really just Twitter except limited to exactly one square picture per post), since even though Twitter may have fewer users, it is more widely used, with a more diverse and influential user base, and because more applications are built on top of the Twitter platform. But Twitter does an embarrassingly bad job of explaining what it is and why it’s supposed to exist. Reach the largest daily audience in the world by connecting everyone to their world via our information sharing and distribution platform products and be one of the top revenue generating Internet companies in the world. It sounds like it was written over the course of a weeklong meeting by a lawyer, a biz dev director and a software engineer locked in a conference room together. “World … world … world.” Run-on sentence. Pronoun disagreement. Missing hyphen. Exceeds 140 characters. Why can’t Twitter figure out what it wants to be? For every reason that I’ve mentioned above and that I will mention below, but also because of a lack of vision. Think about the vision of social networks like Facebook, Instagram and LinkedIn. They’ve all changed radically from when they were small and insignificant, but they’ve all become important in some ways. Now think about the vision of social networks like MySpace and Friendster. Who was supposed to use the latter two, and for what? That’s why the latter two networks were abandoned as soon as their users had better options (and it’s why google plus never took off, and never will). As Steve Jobs observed, focus is about saying no to a thousand good ideas, so you’ll be able to say yes to the one great idea. Twitter doesn’t lack good ideas, but by trying to do a little bit of everything, by trying to be a little bit of everything, it’s running the risk of being nothing. The worst part about this is that Twitter is a publicly traded company, which means they’re reporting to Wall Street and to the public on minutiae of their business like quarterly revenue, plans, targets, &c., which is why they have to change course every few months. And it means that the people in their C-suite are public officials who need to maintain the confidence of the investor class and even of regular users, which is why they can’t recruit and retain solid leadership that can work towards long term goals. Mark Zuckerberg has prevented most of these problems at Facebook, despite taking the company public, by largely maintaining control over what he created. The lesson here is that sometimes it makes sense to have a hierarchical decision-making structure, with one person at the top who bears ultimate authority and responsibility, to make sure that things are effective and efficient, and that it’s extremely important for that person to be legitimate. 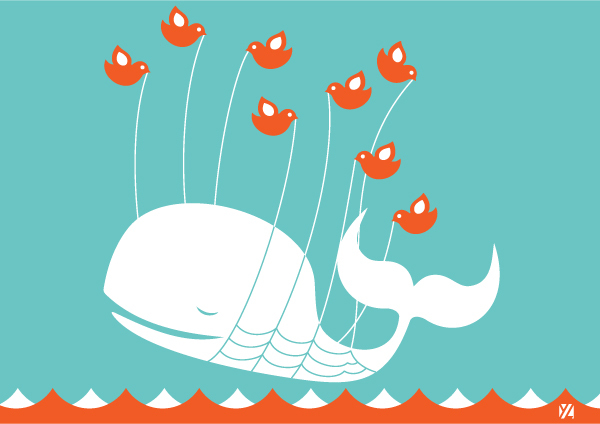 Unfortunately, the lesson that Twitter seems to be hearing is, Make your product more like Facebook’s. That’s why Twitter is attempting to ruin the idea of a simple and reliable reverse-chronological timeline that shows every tweet of every account its users follow: first by breaking tweets into three tabs (Tweets, the default; Tweets & replies; Photos & videos), second by showing “While you were away” instead of everything, third – this hasn’t happened yet – by actually making it very difficult or impossible to see every tweet in one’s timeline. Advertisers love these shenanigans on Facebook, and they’ll love them on Twitter too. Obliterating the timeline is a way of reforming user behavior away from completism and towards curation. Under a completist paradigm, I decide what I want to follow and then I’m presented with all of it (and if I miss something, I can always scroll back and back and back to find it). Under a curation paradigm, I give Twitter some hints (I like Barack Obama, I like Kim Kardashian, I like Robert Griffin) and then Twitter decides what I’ll see and when I’ll see it. But of course, at that point, it won’t entirely be Twitter deciding. It will be advertisers. And it will be over for me and a lot of other core people who love Twitter the product, Twitter the platform and Twitter the community… and tolerate Twitter the company. The following three articles all appeared while I was writing this blog post. I don’t particularly agree with any of them, but I think it’s telling that Twitter is very much a topic of discussion, not just right now and not just on Twitter, because lots of people care about Twitter a lot. [email protected] Who Do You Think You Are? App.net, ATP, Authy, Barack Obama, Ben Thompson, Blogger, Casey Liss (in spirit), Facebook, Farhad Manjoo, Feedly, Friendster, Github, Google, Google Reader, Iconfactory, Instagram, John Gruber, Kim Kardashian, LinkedIn, Marco Arment, Mark Zuckerberg, Moz, Mozcast, MySpace, Overcast, Robert Griffin, John Siracusa, Slack, Slate, Stratechery, The Talk Show, Tumblr, Tweetbot, Twitter, Twitterrific, WordPress. And here’s mine. Happy tweeting! 1. ↑ I seem to recall that Farhad Manjoo wrote about this in an article for Slate, some time around 2012, though I’m having trouble locating the article now. 2. ↑ Though he may not have invented the term “completist,” I first heard it from John Siracusa on the Accidental Tech Podcast. 3. ↑ Feedly is trying to reverse that, and everyone should buy a Feedly Pro account to support their work. 4. ↑ Examples: podcast sponsorships on shows like John Gruber‘s The Talk Show and Accidental Tech Podcast that legitimately inform me about products I sometimes end up buying; or certain “custom” articles on my previous employer’s websites that helped people learn about new medical treatments. 5. ↑ Though this may make it seem like Marco opposes freemium services, that isn’t the case: freemium is how he makes money from Overcast. 6. ↑ The image of the Twitter novice, who’s apparently in a state of permanent befuddlement, can not possibly be accurate, since we were all Twitter novices at one time. A few months ago, Marco Arment listed which of the most popular movies he had seen in the past fifteen years. This amused me because I’ve also notoriously not seen a lot of popular movies, so I was curious to find out whether I’d seen more or fewer of them than he had. Below is the list, which is taken from all of the “best picture” Oscar nominees since 2000, and the top ten highest grossing films in that time period. So, of 241 wildly popular and/or highly esteemed movies from 2000 to 2014, I’ve seen 37, which is 15%. Of these, I’ve fallen asleep 35% of the time. But what’s different? My query was for [keyword], a head term, and the related searches are for body terms: [keyword] + [games], [keyword] + [characters], [keyword] + [wiki], &c.
On the other hand, the “people also ask” section attempts to choose a few semantic questions, to answer them and to provide differentiating links to two different Wikipedia pages. 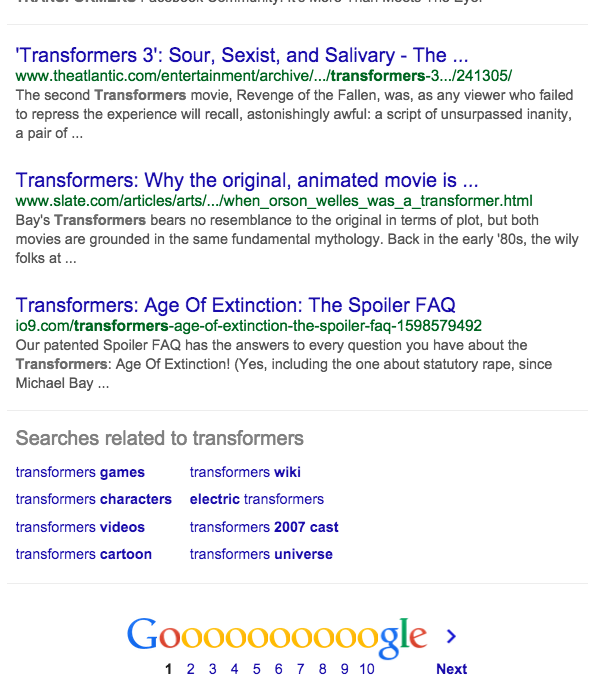 The “Transformers” that I had in mind was the television series from the 1980s, not the movie. But practically every link on this page is to information about the movie. There’s another kind of “transformers.” They’re electrical appliances upon which we all rely every day. 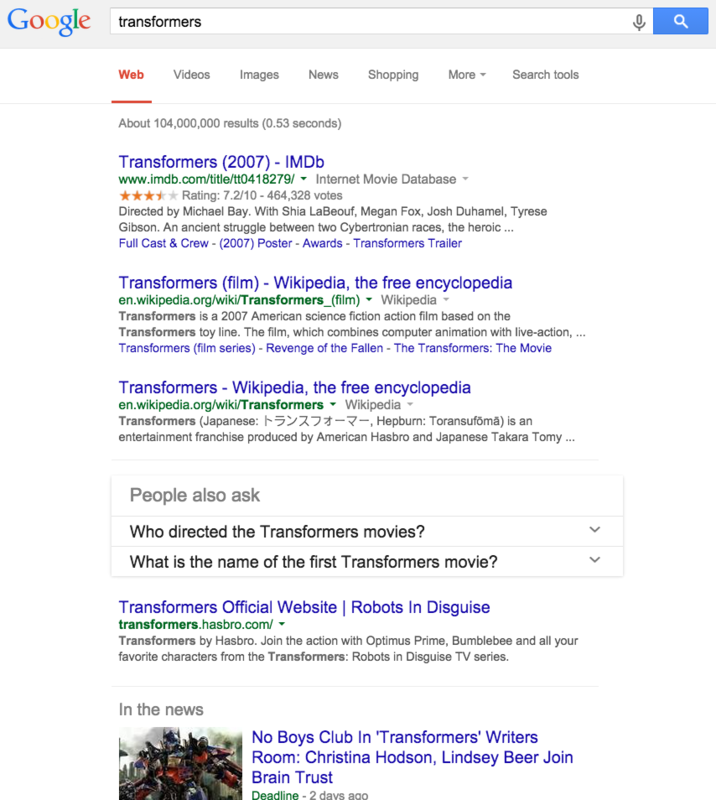 They show up as a related search (electric transformers), but there’s no link on this search result that leads directly to any actual information about that kind of transformers. “People also ask” seems fairly hacked together and out of place. I bet “People also ask” doesn’t last for very long, at least in its current form. Basketball is happening around me (good news: I am not in last place in my office bracket pool thing) and I got curious, for some reason, about the dimensions of a basketball. So I asked Google: basketball diameter. A standard NBA basketball is 9.43 to 9.51 inches in diameter, or 29 5/8 to 29 7/8 inches in circumference. It is inflated to a pressure of 7.5 to 8.5 pounds. 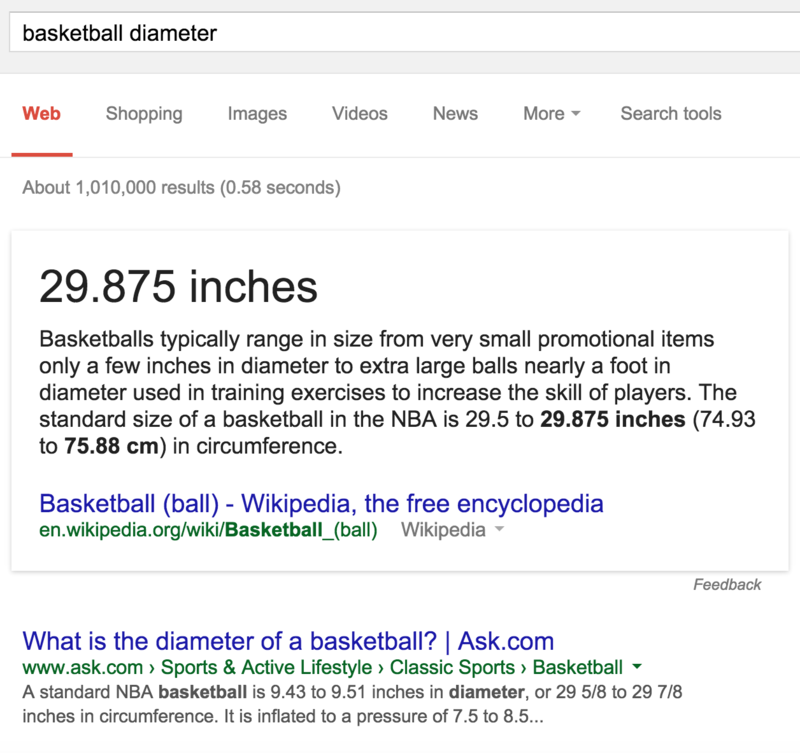 But instead of trusting their own organic search ranking algorithm to provide searchers with the best answer, Google scraped the #2 result to give me an incorrect answer: I specifically asked for the diameter of a basketball; what appeared above the search results was information about a basketball’s circumference. This is a very bad experience. 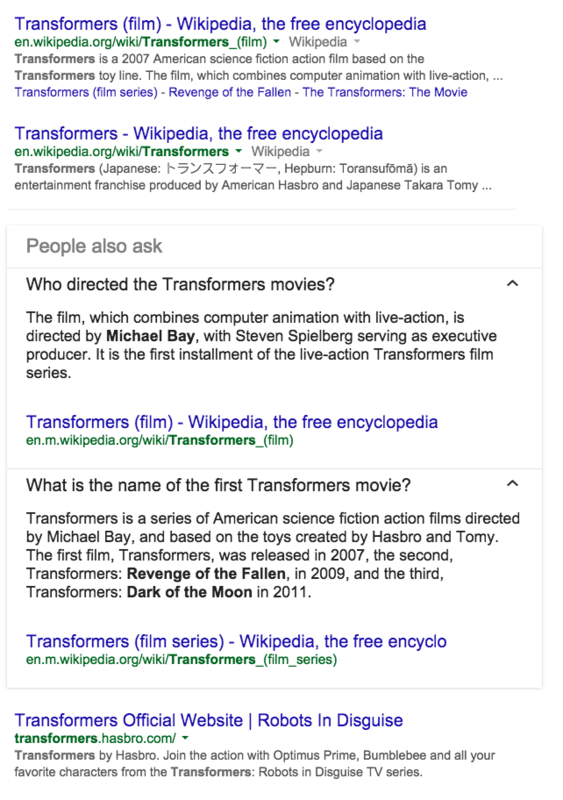 Google should stop scraping publishers’ sites to put answers directly in search results in cases where the nature of the question is strictly factual and where the facts would actually be wrong. Ms. Seles is a paid spokeswoman for Shire, which late last month won approval to market its top-selling drug, Vyvanse, to treat binge-eating disorder, a condition that once existed in the shadow of better-known disorders like anorexia and bulimia but was officially recognized as its own disorder in 2013 by the American Psychiatric Association. Suppose you are a pharmaceutical company. You invest millions, billions, of dollars in laboratories and chemists, and at the end of a very long process, the outcome is a new drug. Let’s call it, for fun, Mezuyafir. You then have to figure out what conditions that drug can treat. If it cures a diagnosable disease, that’s good! But if it just changes the chemical composition of people’s brains to make them more happy, more docile, more virile or more focused, that’s even better. What you now need to do is come up with a medical condition that matches with your new drug. In some cases, the condition may be real and serious; in other cases the condition might be real but not very serious; in other cases the condition will inevitably be frivolous. Let’s call it Magafitis. Then, though it is legal under many circumstances in the United States to market your new drug directly to consumers, you actually market the hell out of the condition with lots of crass commercial advertisements that advise people to “Talk to your doctor about” whatever problem that they never realized was a problem. Hey, Magafitis can be serious! It’s a serious issue! Someone knows someone who knows someone who spent a year in bed recovering from Magafitis! And there is a whole forum on the internet for people to share stories and tips about how to find a doctor who takes Magafitis seriously. Advertising works, so lots and lots and lots and lots of people are going to start asking their doctors about that issue. And the doctors out there – bless them all – are very good at prescribing drugs. Suppose two thirds of the people who talk to their doctors about Magafitis get prescriptions to treat it. If your new drug Mezuyafir is the only one available that treats Magafitis, the condition that you just made up, then millions of people are going to start taking it, and you’re going to become very rich. Are Kuwait and Israel really at war? An Israeli woman who has lived in the United States for the last 15 years was barred from boarding a Kuwait Airways flight in New York because of her Israeli citizenship… A Kuwaiti law prohibits Israeli citizens from flying on Kuwait Airways… Eliazarov has filed a discrimination lawsuit against the airline, which argues that the airline policy violates both state and federal civil rights laws. Putting aside what I believe to be the relevant legal issues here (federal law in the US prohibits private discrimination in public accommodations on the basis of national origin; federal law in the US also prohibits participation in the Arab League’s boycott of Israel), there’s another question lurking behind this story: Kuwait apparently considers itself to be at war with Israel. Why? 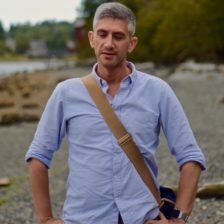 I’ve noticed a few interesting things about people’s accents – especially the accents of people who have migrated from one country or region to another – in the nearly two decades that I’ve been listening to them carefully. One is that people who are consciously using a “prestige” accent can be very convincing for short periods, and when they aren’t under stress, but that when they need to speak at length and don’t have prepared remarks, or when they are in difficult or stressful situations, they’ll frequently revert to their more “natural” accents. In the first two seasons of House of Cards, I observed quite the opposite from Kevin Spacey’s character Frank Underwood. During normal conversation or soliloquy, he used the simulated “South Carolina” accent described by Vox, but when his character was under pressure, the accent got milder or disappeared altogether. This is the opposite of what I’d expect: after a long political career in Washington DC, Frank Underwood’s “South Carolina” accent should be almost completely neutralized. But the longer he speaks at any given time, or the more strain that’s being put on him, the more evident his character’s roots should be. I’m surprised at Kevin Spacey’s oversight on this matter. … This is not how a service works when its developers actually want it to succeed. In 2014 Google announced it would be shutting the service down.